The Nagoya tournament ended with the Emperor’s Cup being handed to arguably the most surprising top division champion in eight years. The steamy meet in central Japan took its cue from the World Cup, delivering a succession of shocks right from the get-go. Big names fell by the wayside one after another before Mitakeumi emerged victorious to end Dewanoumi Stable’s 38-year championship drought. 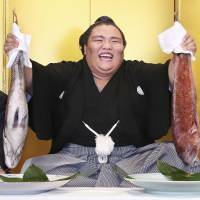 While it might seem strange to describe someone at sumo’s third-highest rank as a shock winner, championships by sekiwake aren’t all that common. In fact before Terunofuji managed the feat in 2015, a sekiwake hadn’t been crowned champion in over 15 years. Mitakeumi hardly gave any indication of what was to come. The Nagano native, now the first-ever Emperor’s Cup winner from that prefecture, had spent the past eight tournaments just barely holding on to his slot in sanyaku (the three ranks below yokozuna), scoring between seven and nine wins each time. That’s all in the past now, and despite his final day loss, Mitakeumi is well and truly on an ozeki run. Eleven wins in September would give him the supposed required standard of 33 wins over three tournaments, but in reality he’ll probably need 12 wins along with a victory or two against the yokozuna as well as being in title contention until late in the tournament. Whether or not Mitakeumi achieves promotion after September, history is in his favor. Of the 24 previous sekiwake to win a championship, eight made ozeki and a whopping 15 others went on to become yokozuna. Only Hasegawa, who won the March 1972 tournament while a sekiwake, failed to progress beyond that rank. Not that the pressure will have any effect on Mitakeumi. Despite claiming to be nervous speaking in front of such a large crowd, he was relaxed and witty during his championship interview at Ryogoku Kokugikan on Sunday, cracking jokes and smiling. Mitakeumi has a history of showing his best stuff when challenged, as evidenced by the way he responded to his loss against Takayasu on Day 12. Facing an ozeki against whom he had a losing record the following day, Mitakeumi easily handled Goeido and all but assured himself of a first championship. That’s been the pattern throughout the life of the 25-year-old. 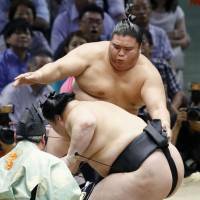 He only took up sumo formally after losing to a smaller opponent in an elementary school tournament. Despite subsequent huge success as an amateur — he was a college yokozuna and won numerous titles — it was only after being challenged to help revive the flagging fortunes of traditional powerhouse Dewanoumi Stable that Mitakeumi decided to join the professional ranks. Now tasked with becoming the first wrestler from the stable to be promoted to ozeki since January 1976, Mitakeumi has the impetus needed to lift further Emperor’s Cups. That giant Silver Cup, of course, wasn’t the only trophy he received on Sunday. 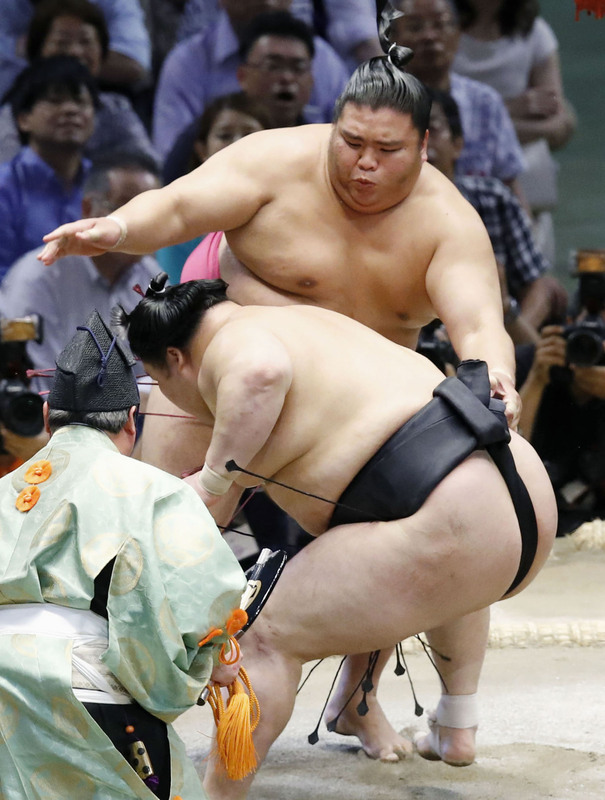 One of sumo’s most unique aspects is the sight of the tournament winner still standing in the ring long after the TV cameras have been turned off, receiving a succession of trophies and prizes from various regions in Japan as well as from countries around the world. Among them are glassware from the Czech Republic, a giant coffee pot from the United Arab Emirates and a trophy with three traditional wrestlers supporting a bowl from Mongolia. One of the more recognizable prizes is an enormous Herend Vase from Hungary. According to Mariko Ikeda of the Hungarian Embassy, the winning wrestler also gets a set of Herend porcelain, consisting of a teapot, six cups, one cream jug and a sugar pot. All are handcrafted and the teapot is inscribed with the name of the tournament winner as well as the year and month. The pattern of the set varies depending on the time of year. Hungary has presented the prize since 1985, when the then-ambassador felt that the links between his country and Japan could be closer and came up with the idea of presenting a prize to the tournament winner. Mexico has also been presenting a prize since the 1980s, with the Mexico Friendship Trophy first being awarded in 1981. The trophy is a silver plaque depicting the Chinkultic disc with its representation of the Mesoamerican ballgame. The two countries have a long history of diplomatic relations with 2018 being the 130th anniversary of their establishment. Many of the various Japanese regional prizes also include well-known consumables from their area and Mexico is no different with a year’s supply of Corona beer paid for by that company included. 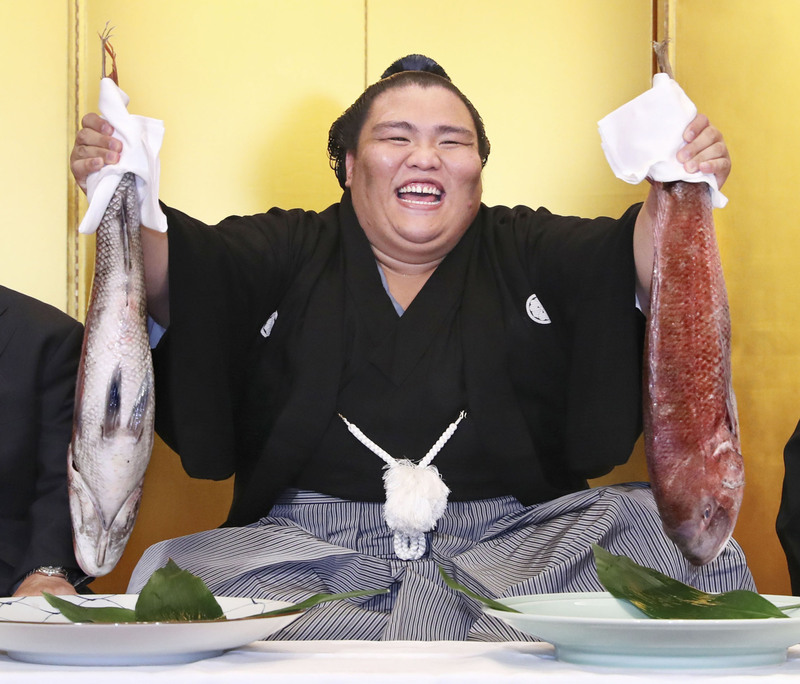 Of course given the voracious appetites of wrestlers, what is a year’s supply for a regular human is often consumed in a couple of months in the sumo world. Mitakeumi also received an ancient Mexican silver coin mounted on a wooden base. The coins are authentic so each champion thereby owns a unique prize. The tournaments outside Tokyo don’t see some trophies presented but instead have additional ones unique to their region. Mitakeumi received the Nagoya Mayoral trophy rather than the Tokyo Governor’s prize for example. His prizes also differ from past winners due to changes to national borders and shifts in the political landscape. The old Czechoslovakian trophy with its “Dedicated by Czechoslak Glassmakers in Demonstration of their Reverence and Friendship” inscription was replaced by the more prosaic “To the Winner of the Sumo Tournament” wording on the Czech Friendship Prize. The Jacques Chirac prize too was discontinued by his successor as French President Nicolas Sarkozy (famously no lover of sumo). France now presents a friendship trophy. Guessing which color giant macaron will be held up during the award has become a favorite game of sumo fans around the world. If promotion to ozeki isn’t motivation enough for Mitakeumi, perhaps collecting the full range of giant macaron colors will be.